This decking board can be used grooved or smooth side uppermost. 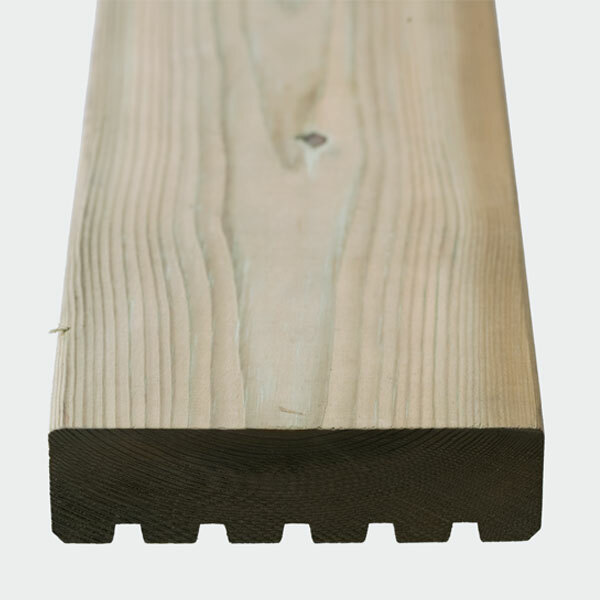 As with the 33 x 120mm Multi-purpose board you can use less supporting joists. It is versatile by design as it can also accept up to 5 Q-Grip slip resistant strips. It is preservative pre-treated with Tanalith E Extra giving the timber water repellant properties. Q-Deck York style decking is made from high quality certified softwood. Its finished size after machining is 33 x 120mm and is a reversible profile. All five grooves of York style decking can accept Q-Grip strips, which enables deck builders to incorporate slip resistant areas to their deck, where it is needed. Having a groove that a Q-Grip strip can be placed in at the edge of the board is very useful for slip resistance applications on step or border edges. Being the largest section of decking in the Q-Deck range makes it the strongest board meaning subframe joists can be spaced at centres up to 600mm. Using the smooth face up gives a more classic contemporary look and actually proves easier to maintain. It is preservative pre-treated with Tanalith E Extra giving the timber water repellant properties.